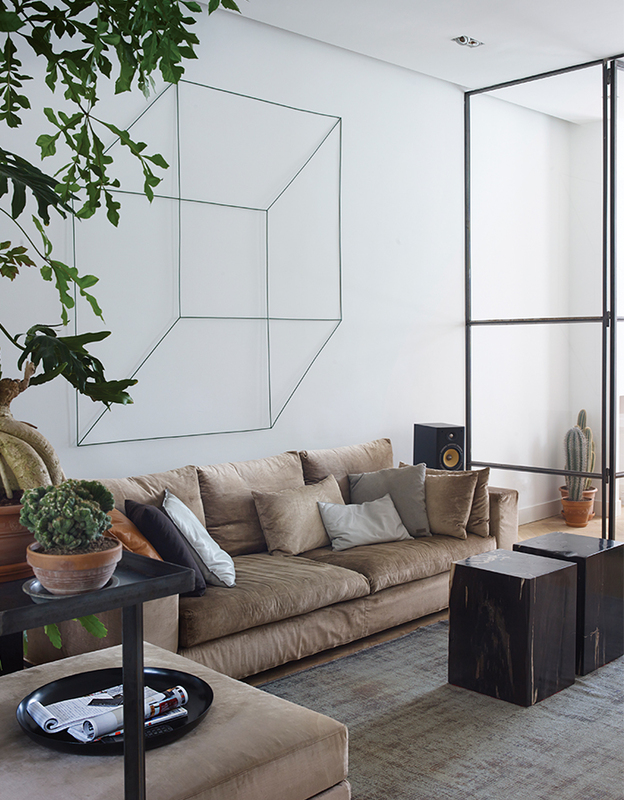 In the main living area of Frank Nederhof’s renovated Amsterdam flat, a geometric sculpture by Antonino Sciortino hangs above an Erik Kuster sofa. The coffee tables are made from fossilized wood so heavy that each one requires two people to lift it. Nederhof and his son Scott sit at a Tulip table by Eero Saarinen for Knoll in the flexible office area. The chairs are by Friso Kramer for Ahrend, and the Corona pendant light is from Established & Sons. Nederhof purchased the vintage teak dresser from an online secondhand store. On it stand fertility statues and a miniature sculpture by Antonino Sciortino. The steel-framed glass doors fold back into the wall, and the space is oriented so clients can enter the office without traipsing through the entire flat. A vintage Danish dining table in palisander wood by Arne Vodder is paired with chairs by Niels Møller. The living room, dining room, and kitchen are arranged in a 60-foot-long enfilade. The pendant light above the table is Nemo by Franco Albini for Cassina. A grouping of succulents and Monstera deliciosa plants act as a natural room divider. The sleek, white kitchen is by Bulthaup. When Frank Nederhof, a property developer and former real estate agent, discovered a fixer-upper for sale near Amsterdam’s Vondelpark, his professional instincts told him it was an opportunity too good to pass up. “As a refurbishment project, it couldn’t have been better,” he says. The house, which dates from the 1880s, hadn’t been renovated since the 1970s, and its last owner, an elderly woman, had lived there for three decades. The edifice featured high ceilings and a footprint three feet wider than most late-19th-century houses. Nederhof decided to gut the outmoded structure and divide the property into a few apartments to sell and rent, plus a live-work space for himself. Nederhof added a steel beam to the main room, which encompasses a living area, dining space, and kitchen. The beam’s distressed finish adds textural contrast to the room and supports an 11-foot-tall, 60-foot-long rear extension that projects into the garden. “I used ultracontemporary materials,”Nederhof says, “rather than taking the traditional wood-and-windows approach.” Steel-framed glass doors divide the space while providing views onto the back garden. His approach to interior lighting is equally considered: LED lights surround the perimeter of the dropped ceiling in the open-plan living, dining, and kitchen area, while mirrored glass bounces light around the narrow master bedroom, making the space appear larger. Furnishings are deliberately neutral to keep the focus on the streamlined architecture as well as on Nederhof’s contemporary art collection, particularly metal works by Antonino Sciortino like the one hanging above the living room sofa. "The pieces of steel just slot together, yet it looks totally three-dimensional. It’s hard to find art that works with large pieces of furniture, but this is perfect." 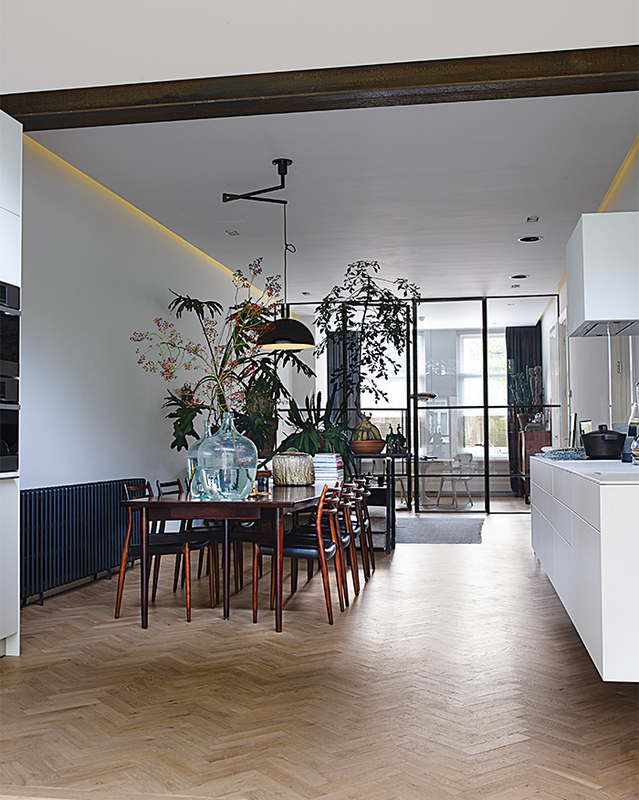 Reinforcing the gallery motif, Nederhof chose Bulthaup kitchen cabinetry for its floating effect. Though happily ensconced in his abode, Nederhof isn’t content to rest idly. He recently purchased a 1930s garage down the street to transform into more apartments—further adding to his new neighborhood’s design capital.